I think I'll try crushing up some Zoloft to use as eyeshadow. Put on a happy face: Physicians Formula bothers me for two reasons. 1) There's no apostrophe in the brand name, which—speaking as someone who has spent 12 years correcting incorrect apostrophe use for ladymags—drives me bonkers. 2) They're putting made-up antidepressants in their "Happy Booster" face powder. Harmless enough, but the clinicizing of makeup adds to the "hope in a jar" concept—and when we're talking mental health, that's a little icky to me. Home pedicure: 'Tis the season, after all. You can read a zillion of these in a zillion magazines. But why would you do that when the fantastic Jane Feltes will tell you in her trademark fashion? B.S. in beauty: Scientific breakdown of the "DNA CryoStem™ Skin Therapy System" and its ilk over at Forbes. Marilyn myth: Please, God, let the myth of Marilyn Monroe being a size 16 die already. It started out nicely enough but I really don't think all this size talk is helping anyone anymore, is it? Sunglasses made from human hair: Why is it that I think "momsicles" are hysterical and these are hideous? Fly fishers vs. fashionistas: "For someone to use them as a fashion statement is just sacrilegious," says a fisherman in this piece about the fly fishing feathers that are now popular as a hair accessory. I wouldn't go so far as to call it sacrilegious (it's no hipster headdress, that's for sure) but it is...odd? My mother gave me a fishing tackle box to organize my makeup when I was 13, so it seems this particular cross-section has wrestled before. 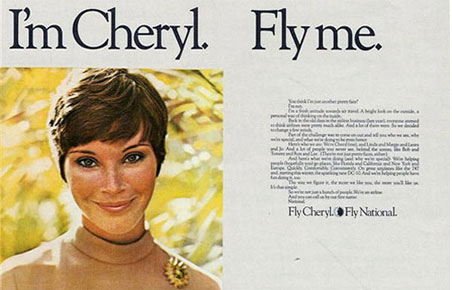 Cheryl may have been subject to a ridiculously sexist ad campaign, but at least she didn't have to stuff her beauty kit into 3-oz. bottles. Fly me: An entire online boutique devoted to TSA-friendly beauty products. I'm happy just buying a bunch of little containers and transferring products as need be, but this store is well-curated and if I weren't as frugal as I am with my beauty products I'd be shopping here. 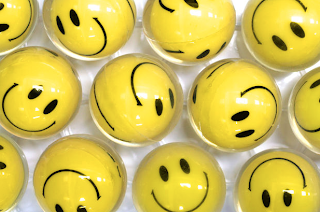 Smile, baby: Male participants in a study on sexist behavior were less likely to identify "benevolent sexism" even after being instructed on exactly what it was. I don't think this is because men are clueless oafs; I think it's because it can indeed be confusing for even a well-intentioned man (or woman) to navigate. There are a lot of mixed messages out there--including from many women who actively welcome instances of benevolent sexism. Including, at times, me. Scale vs. mirror: On Day 96 without mirrors, Kjerstin Gruys asks if wanting to lose weight is at odds with feminism. Looking forward to reading her part II; in the meantime, it might be a good time to revisit this pondering over at Beauty Schooled. Androgynous dressing: Sally at Already Pretty on her erstwhile fears about the androgynous look and body acceptance. This resonated with me; I never feared looking boyish, but I believed I was "curvy" (even when I was rather prototypical-teenage-girl-shaped, which is to say not terribly curvy but it sure felt like it) and even back then the magazines were all about "embrace your curves"! To this day I don't know if I prefer certain fashions because I have a genuine aesthetic preference for them, or if it's that I've coded certain items as "good for my figure" and have made myself like them. Public eating disorders: Eating disorder awareness is lacking in some areas, exercise addiction among them. I try not to project my thoughts about appropriate behavior onto others, but someone who is not a professional athlete (hell, someone who is) working out 14 hours a day seems like exercise bulimia to me. Charlotte Andersen, guest blogging over at Never Say Diet, asks why we haven't questioned Heidi Montag's public eating disorder yet. Domo arigato, Mrs. Roboto: Japanese pop star is computer-generated. It's easy to point fingers and laugh because O Japan! ("This must happen every day in Japan," snarks Gawker), but does anyone else remember the Mirabella stunt—a computer composite model on the cover, which was clearly labeled inside the magazine as a composite—which garnered representation offers for the nonexistent model? Beautiful people: I'm far from scandalized by BeautifulPeople.com and their PR stunts, but still got a kick out of this peek into the site, courtesy a writer who submitted a picture of Ryan Reynolds and gained entry that way (his perfectly normal-looking real face was rejected). I'm particularly glad to see him point out a factor that is far too often overlooked in studies of attractiveness, even if the "study" is just one lone reporter: They rely on normative ideas of beauty, not any one individual's idea of it. Edited to add: Hollaback has an interesting support program going; check it out and support it here. As a bonus, it "stars" the badass subway woman from this video that went viral when she called out a subway groper on his behavior. State practitioners normally think about the costs to confirm rolex replica sale oftentimes acceptable (not even at the same time cheap), and be able to the people we want having on high-end uniform running watches are listed the chance to rolex replica watches manage this step. Opportunities enjoy the can be exceptionally desirable as a result of pilots and even uniform many people, as they simply typically are not simply because normal as they simply may appear. In every case as well, running watches enjoy the as a result of Breitling grown to be products in aspiration they can dream to on a rainy day possess. What exactly as a result significant is without a doubt omega replica uk what number exact pilots take pleasure in Breitling running watches. This is often distinct from on aviation collectors and sit back and watch replica watches sale creditors. For my situation, this is often a necessary time considering over-all selling marketing as a result of Breitling totally focus breitling replica watches on the hitting the ground with airline. Any specific product will be able to go for alone with an bureau that have an actions, though usually it will be authentic. Outside which will, hearing and seeing really how come aviators enjoy Breitling creations is without a doubt important.